If you’re planning a trip, you’re probably thinking about checking out what the likes of CouchSurfer.com or Airbnb have to offer in place of a hotel room, which you know will break the bank. Helping to quell our suspicions, PriceEconomics.com conducted a city-by-city study comparing the costs of renting a room for a one night stay booked one month in advance using Airbnb versus hotels. And the results are heavily in favor of the P2P option. The study reports that renters will save on average 49.4 percent of what you’d otherwise end up spending on a hotel room. Full apartment rentals, on the other hand, command a slightly smaller margin, but still nothing to overlook: Renting an entire apartment compared to renting a hotel room will save travelers 21.2 percent on average. 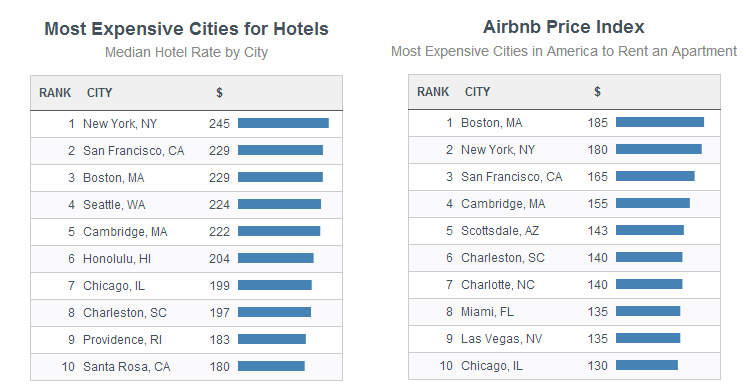 Now, breaking this study down to its parts, hotels are the most expensive in New York City ($245), San Francisco ($229), and Boston ($229), respectively. The Airbnb cost to rent an entire apartment varies ever so slightly. 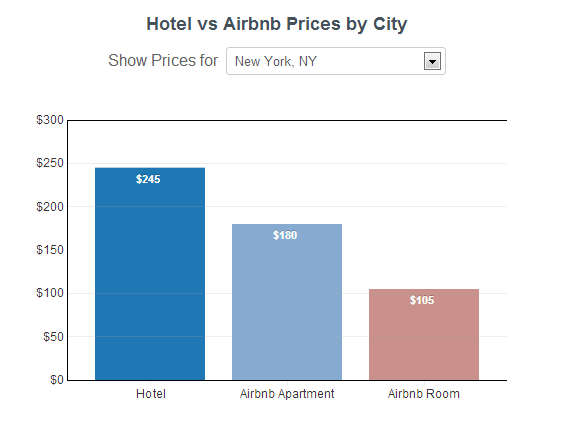 It costs $185 to rent from Airbnb, $180 for New York City, and $165 in San Francisco. Once again, Airbnb wins out again. The Airbnb option is far, far more affordable than renting a hotel room by itself. However, before jumping to conclusions, using Airbnb actually isn’t the cheaper alternative to shack up in an apartment instead of a hotel, where there are fewer Airbnb inventory (rooms) in smaller cities. But if you’re just renting a private room, “it’s almost always much cheaper to stay in a private room than a hotel,” the report states. Fortunately, collaborative consumption is a well-recognized lifestyle choice in most major cities, which helps keep the prices low (due to high demand) and this lifestyle doesn’t necessarily extend to Airbnb rentals exclusively. Uber and TaskRabbit are examples of collaborative consumption services that U.S. cities have come to embrace. Long story short, if you’re trying to decide between a hotel or Airbnb, Priceconomics city-by-city tool can help you make the call – and more often than not, the Airbnb option will win.